Ride the Machine: Album covers: Painkiller. "Painkiller is a 1990 gold-certified album by British heavy metal band Judas Priest. The album was recorded at Miraval Studios, Brignoles, France in early 1990, and mixed at Wisseloord Studios, Hilversum, the Netherlands later that year. It was the first album with current drummer Scott Travis. The original LP, cassette and CD versions were released on September 3, 1990. A re-mastered CD was released in May 2001. The album received a Grammy nomination for Best Metal Performance at the February 20, 1991 33rd Annual Grammy Awards. The Painkiller itself is one of a series of fictional messiahs created by Judas Priest. The Painkiller is described as a metal messiah sent to the world to destroy evil and rescue mankind from destruction. 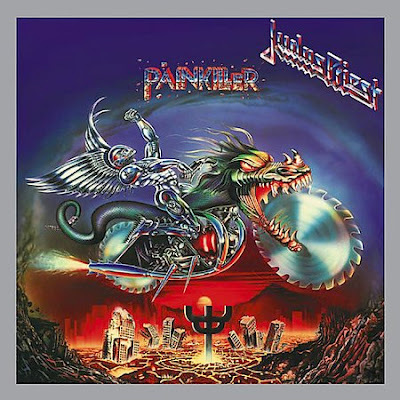 The Painkiller is believed to be inspired by the fallen angel from the Sad Wings of Destiny album cover that Judas Priest recorded early in their musical years. He also makes an appearance along with the Hellion (from Screaming for Vengeance) on the cover of Metal Works '73-'93, and a reappearance on the cover of Angel of Retribution. The most noticeable feature of the Painkiller, besides his metal body is that he 'rides the metal monster'; a motorcycle with a dragon for the chassis and two circular saws for wheels. "The idea for the Painkiller cover was inspired by the Sad Wings cover. I approached the band with the idea that, 'How would that angel in hell look like now in the future, robotic, riding a bike?' It's all about floating ideas, and it worked." "I think the basic concept came out of conversations that we all had about taking the concept of an angel from the SAD WINGS OF DESTINY cover in a ROBO COP type of mode. We put all this armor and stuff on it but it still had the wings - but they were made of steel and everything, and then we thought about the motorcycle that we always use and thought about making that into something unusual, like a man-machine kind of animal thing and then the dragon-bike developed out of that and all of these things came together." "It's a typical fantasy Priest character, you don't know whether it's from heaven or hell but you do know you wouldn't like to meet him on a dark night or to upset him. We did feel that maybe we'd over-used that type of image, but it¹s sort of expected from us. And it¹s just a bit of fun really." "The band originally suggested a Hell's Angel-type character on a motorcycle, but also with a metallic creature. My recollection is that he would have been a pillion rider, or maybe even made into part of the bike. Eventually, I had the idea of flipping the idea on its head and having the metal creature sitting on the bike; making the bike the living creature instead. And the chainsaw idea came to me because my studio at the time was above a hardware shop!" Fun Fact: During the tour for Painkiller, Halford rode onstage on a large Harley-Davidson motorcycle, dressed in motorcycle leathers, as part of the show. He collided with a drum riser and fell off the motorcycle, breaking his nose. After regaining consciousness, Halford returned and performed the whole concert.